By contemporary standards, the Sprint was an exceptionally rapid car and quite lived up to its name. It embarrassed almost every other supercar at the time in terms of outright acceleration up to about 90 mph. 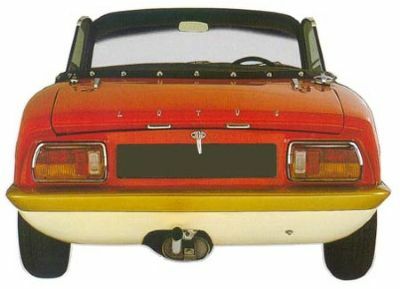 This electrifying performance was accentuated by the brilliant handling and road holding, allied to the small size and weight of the Elan, which meant that a well driven Elan on a dry road could outclass any other non-Lotus road car. I know I am biased, but read the contemporary road tests to get an idea of how well respected the Sprint was for its handling and performance. Reportedly, the 3.55:1 differential gave a top speed of around 130 mph. Lotus PR chief at the time Don McLaughlin recalls doing 134mph in Belgium, which dropped to 128 mph with the lights up. A Sprint/5 owner has not found top speed affected, nor has another - on the flat, although he has had the speedo needle down to the ignition light downhill; an estimated 130 mph. This fits in with John Bolster's view of what an overdrive fifth gear would give an Elan. Again, with the Sprint/5, touring fuel consumption can reach circa 38 mpg, and on one 600 mile trip - up to 42 mpg. This compares with a test figure of 30.5 mpg by "Motor" with their 4 speed Sprint.